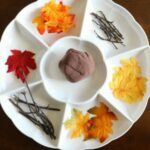 This apple pie play dough activity is a fall sensory experience that engages the senses with the smell of apple pie. My kids couldn’t get enough of it! 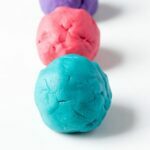 My kids love a good play dough activity. 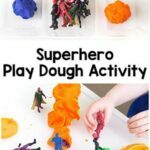 They have enjoyed this this book inspired play dough invitation, this scarecrow play dough invitation and this ocean play dough. We even learned about weather with play dough. 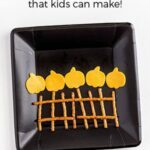 Since nothing signals the beginning of fall better than apples, I planned a few neat apple activities for the kids. 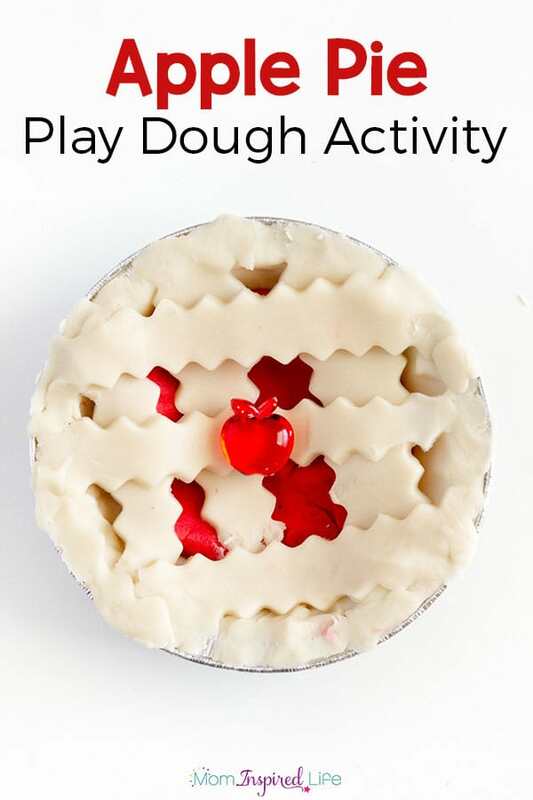 Number one on my list was this apple pie play dough activity. I just knew my play dough loving children would love it. And boy was I right! They had a blast with this play dough invitation! 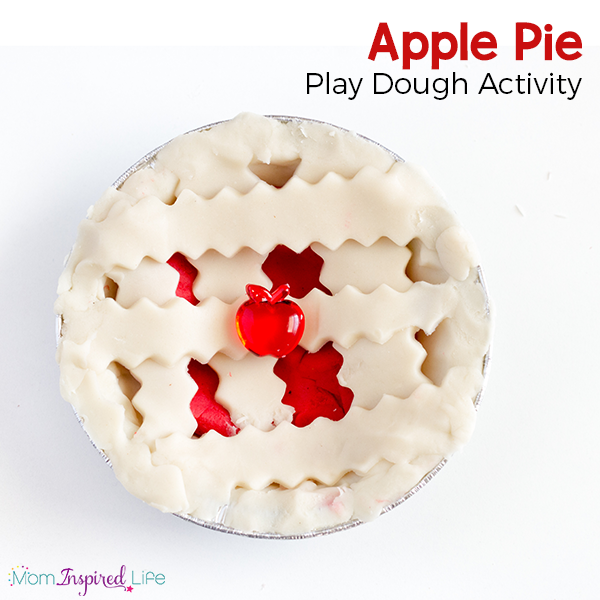 My husband and I were amazed by how long this apple pie play dough activity lasted. 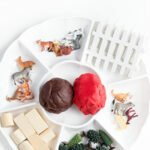 Click here for my play dough recipe – no cream of tartar needed! 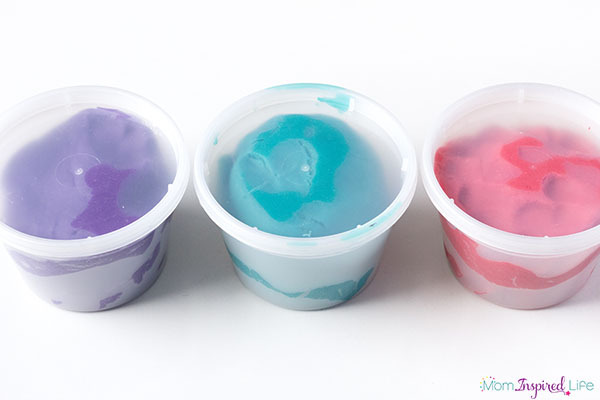 Follow the steps in my play dough recipe post, but for the red apple pie play dough add several squirts of red gel food coloring to the water mixture. Then a 1/2 teaspoon of nutmeg and 1 teaspoon of cinnamon to the dry ingredients. For the pastry play dough add a tablespoon of vanilla extract to the liquid ingredients. That is all. You will now have an amazingly soft dough that smells just like apple pie when used together. 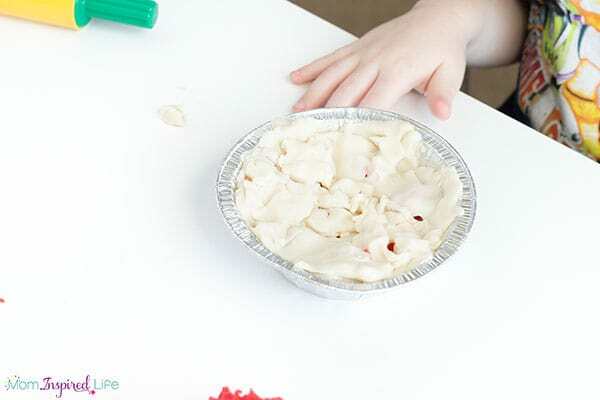 Put the pie tins, play dough tools and the play dough on the table and invite your kids to make their very own apple pie. My kids were incredibly excited to get started. But first they had to sniff the play dough. They thought it smelled wonderful. Since I have never made apple pie with my kids, I used this as a fun opportunity to show them some of the steps involved. 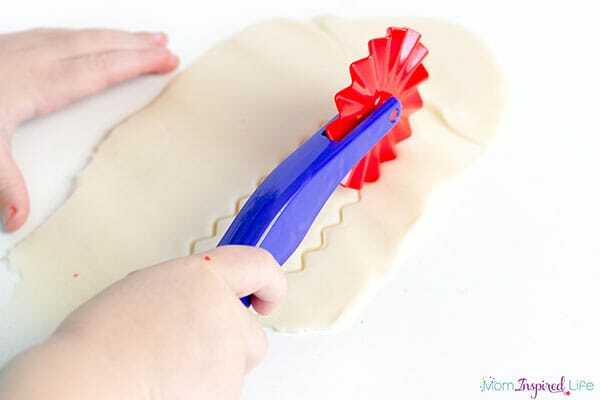 First, they rolled the pastry play dough with the rolling pin. Then they pressed it down into the pan and up the sides. 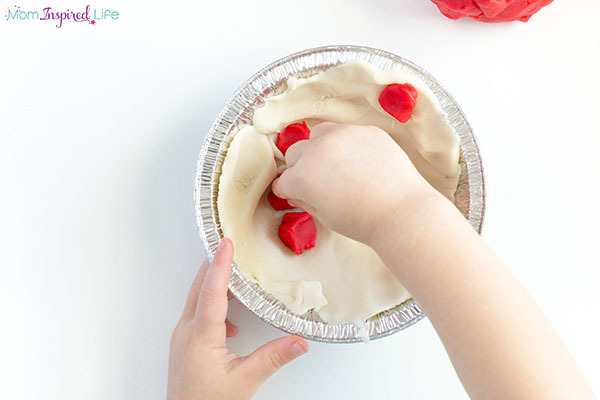 Next, they rolled balls of the red apple pie play dough and placed it on the pie crust. They did this as long as they wanted. Then they rolled out the remaining pastry play dough and I showed them how to use the dough cutter to cut strips of dough and place them on top of the pie. This was my toddlers favorite part. Don’t expect it to look like the first picture in my post. My son’s ended up looking like this. Haha. Now they had an awesome play dough apple pie that smelled so good! 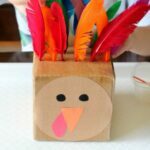 This was amazing for working on fine motor skills! All of the rolling, pressing, pinching and cutting are perfect for developing the small hand muscles. After your done, store the dough in Click here for my play dough recipes in the fridge. My kids ended up mixing a bunch of the dough together and now we have one huge hunk of apple pie smelling dough that they have played with every day since. It smells so good!